Hi it has been a while since my last review of 76105 The Hulkbuster: Ultron Edition on 24 January. Endgame will be showing in the cinema this 24th April and I'm very excited for the movie! Let's put on the Quantum Realm suit and go time travel! I got this one as a gift from @makoy and it's my precious now. Thank you so much my friend. 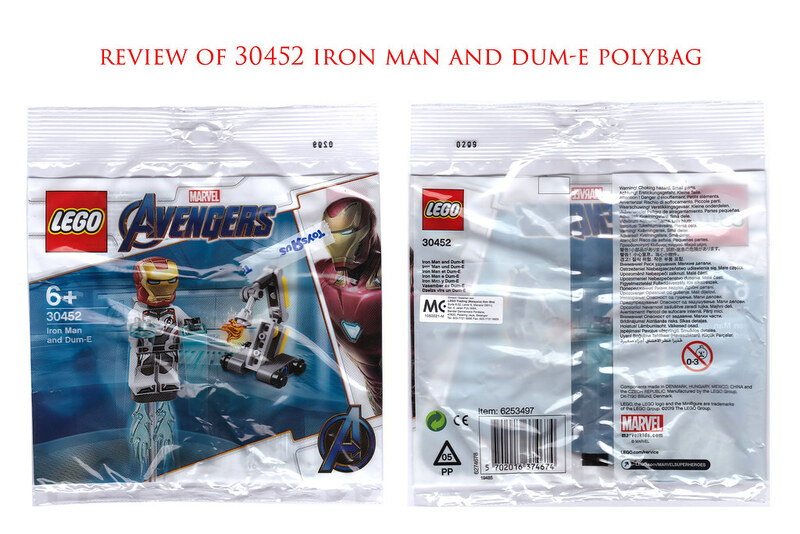 The bag looks pretty clean with white background like those Quantum suits and the front art features Iron Man Mark 85 and the content of the bag. 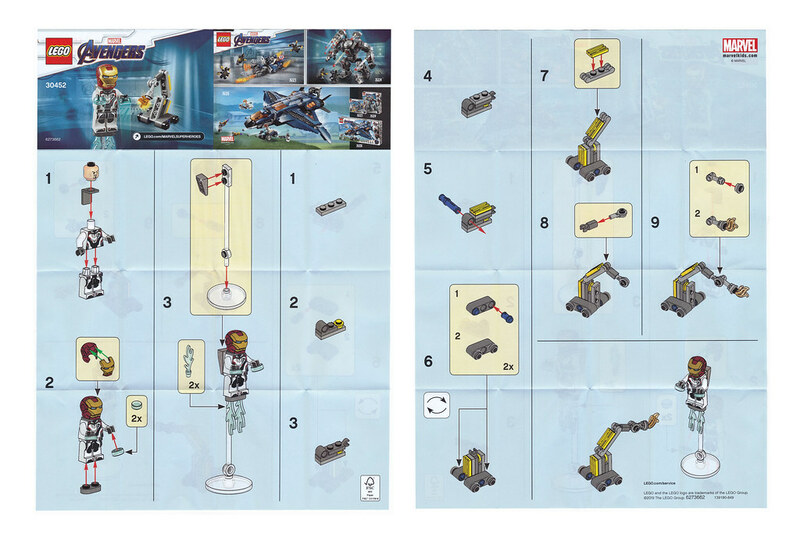 Here is the two paged instruction of a small build of Iron Man in Quantum suit and Dum-E. As you can see, there's still room for advertisement of other Avengers Endgame LEGO sets at the top right corner of the first page. 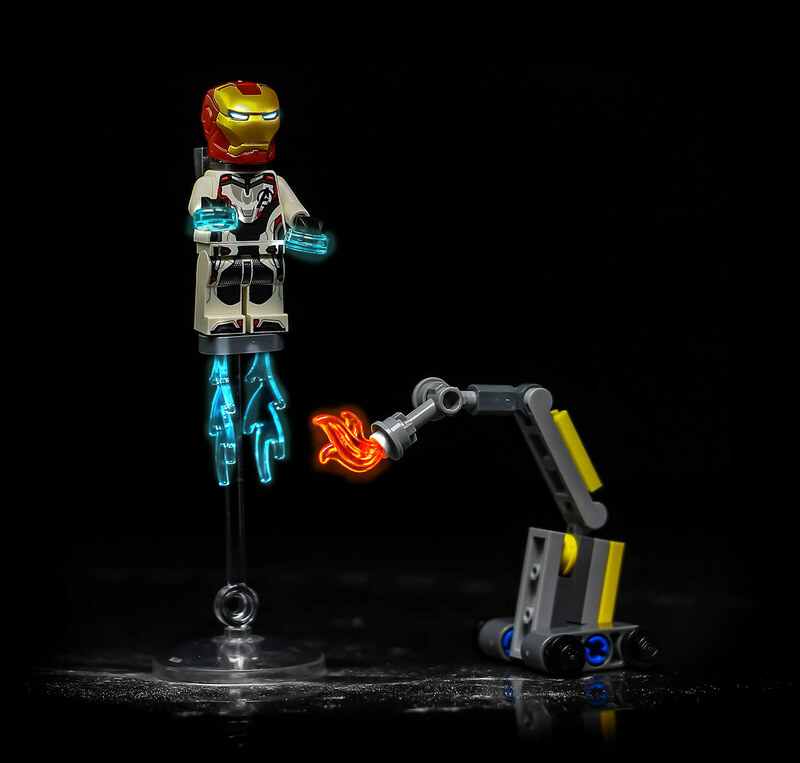 Here is the main character of the set featuring Iron Man in Quantum suit. 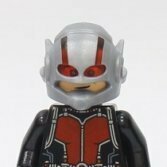 This is the exact same Quantum suit (torso and legs) of the other sets so it is not so 'exclusive' to the set as you can take the helmet and mark 50's Tony Stark head to put on other Quantum suit. Tony's head is also the exact same Mark 50's head. But this will be exclusive when you need to take a group photo of all of them wearing the same suit with different heads. About the suit, despite being so common in this series, it is actually a very clean and nice looking suit with the matt finish of the center part of the torso, Avengers logo and a pinch of reds sprinkled on the torso and legs. Good thing is the legs are also printed makes it look cooler. Dum-E. 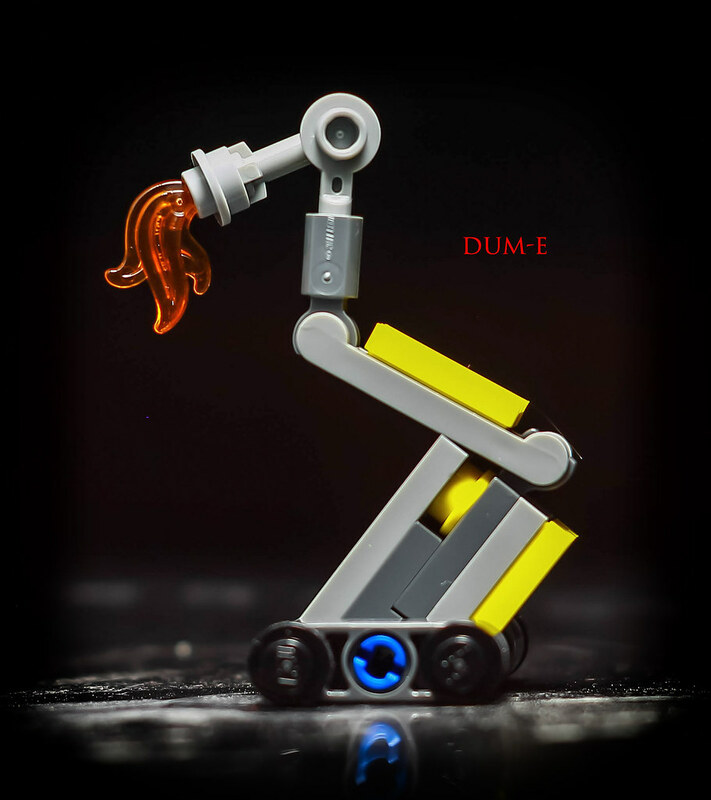 This is a simple build of Dum-E that assists Tony in his lab. The design of this build is simple yet wonderful. The base is actually resembling its wheels with the use of two black 1x1 round plate. The connector between the arm and the base is kind of 'decorated' by some yellow bricks and connected with the blue technic pin in the middle. The mechanical arm of this build is actually one hinged arm and can only be moved upward and downward. However as it goes nearer to the flame, the articulation improves by the use of this Light Bluish Gray Bar 1L with 1 x 1 Round Plate with Hollow Stud which makes 360 degree rotation of the flame possible. The Light Bluish Gray Bar 1L with Top Stud and 2 Side Studs which connects the flame part also helped in articulation of the mechanical arm. The 'play' feature of this polybag is kind of making Iron Man fly with the help of the Trans-Clear Bar 12L with 1 x 2 Plate End Hollow Studs and 1 x 1 Round Plate End and the Trans-Clear Dish 4 x 4 Inverted (Radar) with Open Stud which is labeled NEW part in Bricklink. I really loved the dish and bar here which can be used to make lots of other things fly and helped a lot in LEGO flight photography! 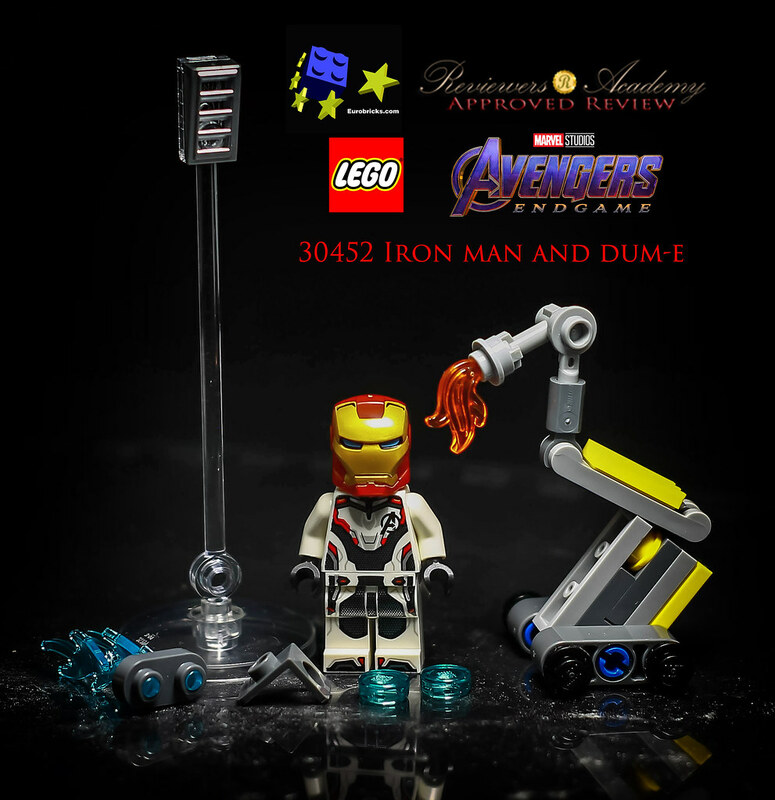 This set features the new design of Dum-E which can be easily MOC out and the 'exclusive' Iron Man minifigure. To me it is quite special that the Iron Man here uses the round trans blue tile instead of plate which is quite surprising yet interesting. Other than that it is a quite simple polybag to me. Playability: 6/10 - Very simple posing features of Dum-E and flying Iron Man. Design / Building Experience: 6/10 - Very simple build. Minifigures: 8/10 - The Quantum suit is actually very nicely designed and printed. Price / Value for money: 8/10 - It is a free promotional item. But it is a priceless gift for me by a very good friend. Overall: 8/10 - A crucial polybag to be collected if you really need a complete Quantum suit Avengers. It can still be replaced by putting iron man head on the other Quantum torso and legs. After some research in bricklink, the NEW Dish 4 x 4 Inverted (Radar) with Open Stud is actually exclusive to this polybag! So it's a worthy polybag after all. Hope you enjoy the review, do share your thoughts in the comments! I knew there's something special about that dish because I have not seen it in transparent before. Glad that this small set is in the hands of worthy Marvel collector. The small parts included are very useful for greebling in case you want to part out those. They use the same 3x3 transparent dish to make Sweet Mayhem's Star "hover" above the ground a bit in the movie maker 2 set. Also the same set has 6 of those 12L clear bars , a pretty cool piece to make small things give the illusion of flight. Certainly a cool display effect to see in a small polybag like this. Free? I seen Walmart selling the set for $4 (hopefully it will go down soon). When I seen it I thought it wasn't worth it for another Ironman figure (and Dum-E). Especially since I have the Malibu Mansion Attack set. Thanks for a nice little review on an also nice little set. I'm looking forward to get the set - if only I knew where to get it. Free promotional item? S@H doesn't show a result when looking for '30452'. Any other availability in Europe?